This indicates that your eye is not exactly round but is more of a rugby-ball shape. It is shortened to “cyl”. Not to worry as over 80% of errors have a cylinder. This is commonly known as astigmatism. Cyls below 0.75 generally do not require astigmatic (also termed as “toric”) lenses. This is the direction of your cylinder and is represented by an angle from 0 to 180 degrees. Sometimes shortened to Ax. 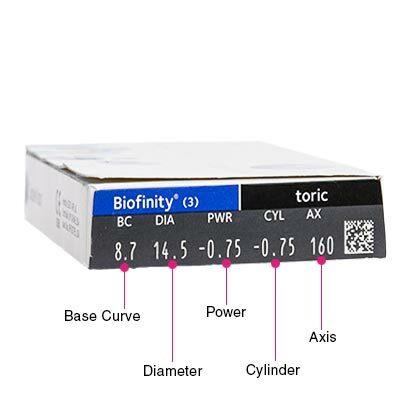 Clear, precise and stable vision is delivered all day long with Biofinity Toric. 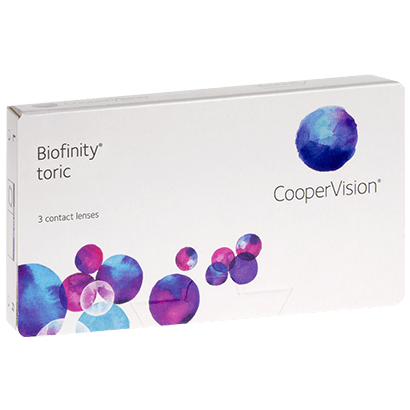 Designed to correct astigmatism, these toric contact lenses provide a comfortable, hygienic and reliable option for your visual correction. Optimised Lens Geometry has been implemented by manufacturer CooperVision to ensure that your monthly contact lenses remain on your eyes during wear, resulting in zero interruptions to your vision and comfort. Enjoy freedom from glasses, and freedom from blurring, glares or halos with these impressive monthly contact lenses for astigmatism. Biofinity Toric are silicone hydrogel contact lenses that permit a flow of oxygen up to six times greater than the of standard hydrogel lenses to pass through the lens. An increased supply of oxygen promotes healthier eyes, keeping them feeling fresh and comfortable during wear. These lenses have been designed for long-lasting moisture with Aquaform Technology offering hydration for your eyes all day long. Perfect for those with a busy schedule or who are out of the house all day, these toric lenses can stand up to the demands of even the most tiring of days. Maintain the quality of your Biofinity Toric contact lenses and uphold exceptional hygiene by following a simple lens cleaning regime. Every night, you’ll need to take out your lenses, then clean and store them overnight in contact lens solution. If approved by your optician, however, you can wear these lenses as extended wear lenses for up to a week, both day and night. Air Optix for Astigmatism are similar toric lenses. Really comfortable lenses, good for long term wearing as well. After years and years of struggling to find a toric lens that is both comfortable and gives great vision, Ive finally found it. These lenses were recommended to me by a friend and I would, in turn, recommend them to others. Never had a problem so far with these lenses. Good value for the lenses. This is my second order and these are the most comfortable contacts I''ve ever had...and of course the price is great. Feelgood contacts is my go to place for contacts now. Love the service and product. Wow! What an improvement. Thought It would take a while to get used to them reading other comments. 1st day and had to check they where still in. 17 hours wear with no dryness or discomfort like I used to get with my other contacts. US buyer, decent shipping and great product! Easy to put in and take out, very comfortable to wear, and lasted a month without any problems. Would highly recommend. Really pleased with these contact lenses. Very comfortable. I''ve used these lenses for more than three years and have no complaints whatsoever. Unfortunately my eyes got dry easily with these contacts and they would get really blurry, I would have to have eyedrops with me at all times. Really comfortable. My optician is cool with me using this for a month before changing them so that''s good enough for me. Good product, works well in a dusty environment. Great company. Extremely efficient and fast service. I had been using them for years and they never disappoint. Excellent service. Ordered *after* 8 and still received next day! I’ve always struggled to get the right level of comfort with clear, crisp vision from a toric lens. 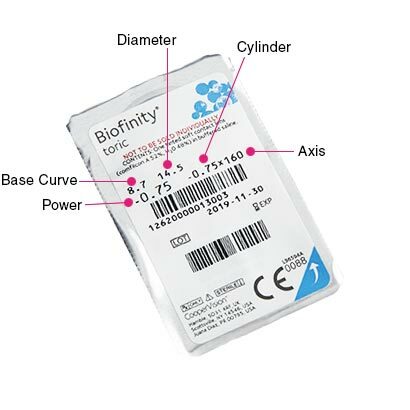 Coopervision’s Biofinity Torics deliver both in spades. I have the sharpest vision I’ve had wearing lenses for over 20 years, and can comfortably wear these for 14 hours every day. They dry out a little, but one drop of wetting solution in each eye twice a day and they’re perfect. I’m only sorry I didn’t discover them sooner! And buying through Feel Good Contacts they’re cheaper than my previous lenses, too! The only ones I can use. Technology is dead ,no advancement..need better new better product. I LOVE BIOFINITY LENSES! SO COMFY AND YOU CAN FEEL YOUR EYES BREATHING! THATS WHY I LOVE FEEL GOOD CONTACTS? EVERYTIME MY ORDER COMES EARLIER AND IN GREAT PRICE! THEY ARE VERY FRIENDLY AND POLITE AS WELL! THE BEST! Vision is fantastic with these lenses, only negative point is that my eyes can get quite dry after 6-8 hours of wear. I have glasses so tend to take them out in the evening. I’m sure a moisture spray would fix this for all day wearing. On the whole a very comfortable lens. Can wear comfortably for up to 10-12 hours. Sometimes the vision is not always correct & have to throw away a pair of lens every now & again which can be frustrating. Great lenses. My eyes don''t dry out with these. Great lenses, good stability in eye and don''t dry out much. Good quality lens that lasts well and cleans up well. Been using them for years and would recommend. Astigmatism is tricky, but these lenses have made them so easy !!! I have been using these for a number of years now. Great lenses. Very comfortable and last the full month. My wife has been using these lenses for three years now, and we have been purchasing these contact lenses from Feel Good. Great lenses at a great price! Comfortable , I have tried other lenses and these are by far the best for me. These are the best lenses i have used to date, They are extremely comfortable due to the high water content , they were recommended by my optitian for my astigamatism and dry eyes , i have a high prescription -6.5 & -10 I wear the monthly''s , they dont come in dailys but i order a 3 month supply and they are good value . My optician did not recommend Biofinity Toric monthlies for my eyes as they can be dry. I bought them from Feel Good Contact Lenses as they were such a good price. I can honestly say that the these lenses are more comfortable than my dailies and the vision is just as clear. The bonus is that I can wear them for 15 hours with no problem and if I am tired, I can take a knap without them drying. Superb lenses, I will purchase again. Good, comfortable lenses, no issues. I have been using this brand for more than a year. Found this lenses is far better than Bausch and Lomb, as this brand makes your eyes moisture more longer. Fantastic value lenses, more than half price from my usual Opticians. Great service and will definitely order again. Have been using these lenses for years. A well-known optician wanted £22 a month if I signed up to direct debit, otherwise £33. These work out at £10 a month! These lenses make my eyes sting so had to go back to soft lens toric. Great brand,tried few others more expensive then these but these are most comfortable. Very soft contact lens - when you have these in, you would not know. Good product. Really comfortable lenses - perfect for my dry eyes too. Good product! Good for dry eyes!